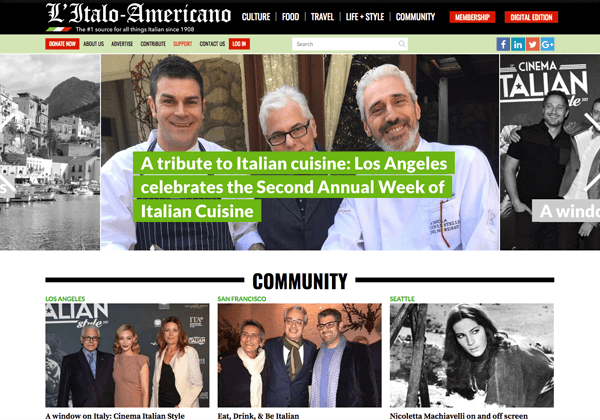 L’Italo-Americano Magazine is a California-based publisher (Los Angeles) who has been promoting Italian and Italian-American culture in the Unites States since 1908 and it’s, as a matter of fact, the oldest Italian-American ongoing publication in the United States. The project with L’Italo-americano started on classic basis of consultancy, but soon the relationship evolved to the point that Massimo Burgio has been asked to be their temporary outsourced Marketing Director, in charge for the magazine’s marketing efforts for 6 months. During that time, the activities that have been carried on and completed withing th emagazine’s organization has been several. Under Truly Social’s guidance, the magazine has improved the website design, making it fully responsive and optimized for search engines, and also skilled up the entire editorial, publishing and marketing team with a number of training sessions on the basics of internet marketing, SEO, optimized copywriting, social media strategy, social media marketing, social media engagement and content marketing. As part of the Marketing Director job, Massimo has also offered daily strategic advice to the management and the Editor-in-Chief, and created and launched a couple of special editorial initiatives such as a day-by-day blogging from a Saint Francis pilgrimage in Italy, and a fundraising raffle with great travel prizes, that included negotiating partnerships with travel and gourmet food brands to get them involved on the prize side. The raffle also worked as a fundraising campaign for the victims of the earthquake that destroyed Central Italy in November 2016, cross-benefiting the local charity association I Love Norcia. Among other Marketing tasks that have been carried on for L’Italo-Americano magazine are: the redefinition of advertising pricelist and formats for both online and offline; implementation of content marketing strategies with the editorial team, and of social media engagement actions with the social media team; advice on other publishing business by the same publisher (a book series); negotiating content and advertising partnership with Italian real estate prime players, and managing content partnerships with Italian publishers; strengthening content-based nationwide relations and helping growing L’Italo-Americano community in several other states, including Texas, Florida New York and New Delaware; investigating growth opportunities through italian-american-focused side business (i.e. creating an award, launching a festival).